Disable Dates allows you to select one (or more) date range or a single date that need to be blocked. And optionally, you can make it repeat every year. 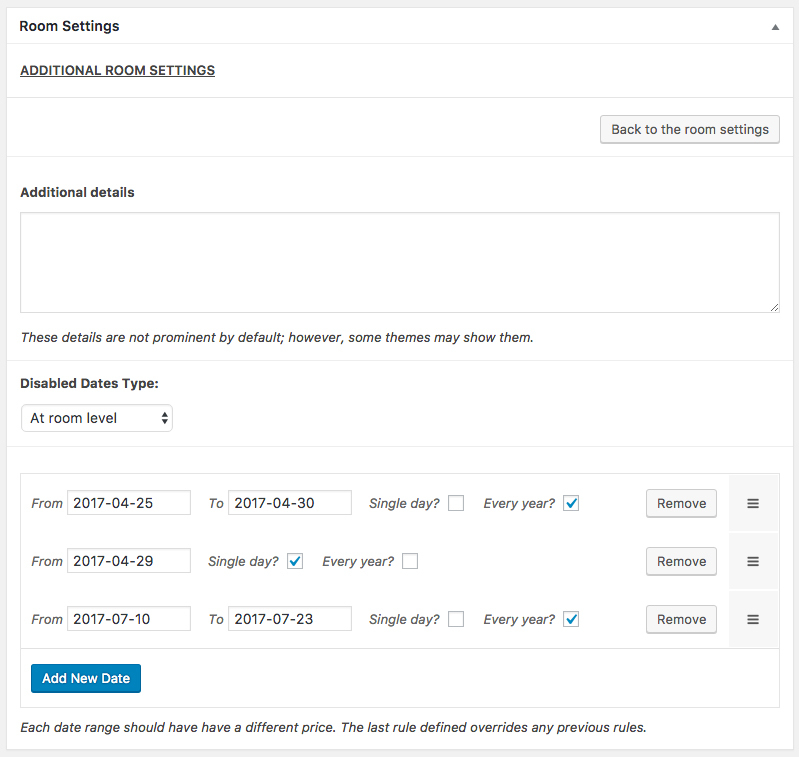 To block some dates globally (all your rooms) go to Hotelier > Settings > Rooms & Reservations and add some date ranges in the Disable Dates table. Check this option to disable only a specific day. Check this option to make it repeat every year. This option allows you to hide the disabled dates in the datepicker. If disabled dates are managed at room level (see next section), only the dates from the datepicker of the single room page will be hidden. If enabled, a guest can select the first disabled date (after a valid date) for the checkout. Let's say you have this date range disabled: from 03 April 2020 to 09 April 2020. With this option enabled, a guest can still use 03 April 2020 for the checkout. You can configure each room individually, overriding the global schema and using custom date ranges for specific rooms. Just edit a room and click on the Additional settings button. Inside that panel, you will be able to set specific date ranges for that room (be sure to select At room level in the Disable Dates Type dropdown).